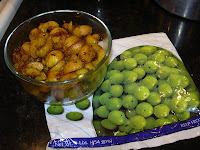 I bought the whole packet of frozen gooseberries to make this pickle. But somehow or the other I didn't get time to start this and I started using few gooseberries for making pachadi or arachukalakki etc. This time I wanted to make this pickle without fail and I started making this yesterday night around 9 PM. It came out well and it tastes really good(I wanted to have this pickle as side dish for yesterday's dinner). First cut the gooseberries and take out the seed. 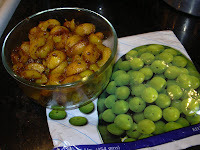 Put it in a microwave safe bowl, add water and cook it for 4 to 5 mts. Make sure its only 3/4th cooked. Take out the berries and drain it. Keep it aside. 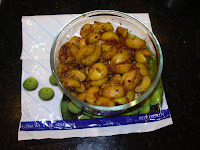 Now take a pan, pre heat oil, splutter mustard seeds **, add fenugreek seeds ** and asafoetida powder and saute' for about a minute. Now add turmeric powder, red chillies powder and salt to it and fry it till raw smell goes out. Now add 3/4th cooked berries to it and mix everything well. It take 2 mts to mix. Turn off the stove and sprinkle the jaggery powder on top of it. Mix it well. Transfer it to a air tight container and enjoy it for more than 10 days. ** - My MIL asked me to make powder from mustard and fenugreek seeds and sprinkle it. Since I started doing this at night I didn't want to make powder. I just used it. If you wish to make powder, just fry mustard and fenugreek in a dry pan, let it cool and grind it into a fine powder (can grind separately). This pickle goes to Vani's AFAM event. I love pickles very much but its being ages I have tasted this pickle.looks delicious.. Thanks for sharing and participating! Gooseberry pickle i love it. Looks gr8 and nice entry to the event. hey! that's looking very delicious yar! I like your recipe. It reminds me of my grand mother's cooking. Your method of pickle preparation is very similar to hers.